In the previous posting I described the God helmet experiments of Persinger briefly and Persinger's own interpretation of the results. Anyone interested to understand what neurotheology is about should listen the inspiring talk God and the Brain - The Persinger 'God Helmet', The Brain, and visions of God by Todd Murphy. In this posting I will discuss the TGD inspired interpretation of the results of Persinger's experiments. To put it in very concise manner: whereas Persinger interprets right brain as "visitor" explaining sense of presence experiences and even meeting of God, I identify the "visitor" of the visitor experiences as the personal magnetic body or in the case of enlightment experiences as the emergence of a new layer to its fractal structure. Magnetic body would be also responsible for the third person aspect of conscious experience, which means that we tend to see ourselves from bird's eye perspective. Magnetic bodies make as social animals, and are responsible for the cultural evolution and explain why we differ so much from our cousins although the genomes differ so little. 1. Frequency modulation as a "code of consciousness"
Maxwell's electrodynamics would suggest that a superposition of endogenous and external magnetic fields takes place in God helmet experimens and is partially responsible for the effects. This is clear from the fact that quite spesific magnetic stimulation is used (signals derived from EEG during the second stage). In TGD framework one should be able to interpret this. In TGD Universe endogenous magnetic fields could form a fractal hierarchy: flux quanta inside flux quanta. Several critical values of magnetic field expected. Flux quanta could be flux tubes or sheets (DNA strands could be traversed by flux sheets and one could have hierarchy of genomes making possible collective gene expression at various levels). There is a hierarchy of Planck constants so that one can assign to the cell membrane potential a Josephson frequency proportional to 1/hbar and to cyclotron frequencies photon energy proportional to hbar. The code for the communications from biological body to various levels of the magnetic body relies on the modulation of the Josephson frequencies assignable to the cell membrane. Assuming that the value of Planck constant is integer multiple of its standard value these frequencies span an enormous range. In the case of EEG the Planck constant is of order 1013 in order to for photons with the energy of visible photon to have frequency about 10 Hz. Since Josephson frequency is proportional to the membrane potential, the modulations of the membrane potential induce modulations of Josephson frequency so that the signal sent to the magnetic body is modulated and this frequency modulation must define the "code of consciousness". The frequencies involved with these communications are sums of harmonics of Josephson frequency and cyclotron frequency and also cyclotron frequencies can be modulated by modulating magnetic fields. The simplest possibility is that the external magnetic field induces modulation of the magnetic field. This modulation is small since the field strength is of order .01 Gauss and by a factor 1/20 smaller than the endogenous magnetic field Bend=.2 Gauss suggested by the effects of ELF em fields on vertebrate brain. Of course also other field values are expected to be present. The basic philosophy behind the TGD based explanation of God helmet experiences differs in many respects from that behind the model of Persinger and Murphys. Therefore it is good to describe this philosophy first. In the normal social consciousness based strongly on verbal communications the left brain self dominates and social interactions actually split the left brain self from right brain self so that right brain self remains a silent companion unable to express itself except throught intuitions. This raises some questions. Could just the need to communicate the experience verbally automatically project "me" to left brain me and cut if from "right brain self" so that only the memories of left brain self are communicated. What would happen if the subject person would communicate with external world by singing? Often persons who have lost their ability to speak and comprehend spoken language can communicate by singing. Would the the projection occur to left brain self and could the memories be different? Persinger and Murphy seem to assume that right brain is God from the perspective of the left brain. Magnetic body is responsible for the third person aspect of consciousness and also for the ability to see the dying biological body from the bird's eye perspective during OBEs accompanying also NDEs, which accordingy to Murphy could be quite real. There is indeed evidence that a subject person unable to move from bed has been able to see objects which she should not have been able to see. If magnetic body is real it could also receive extra-sensory information. Could the magnetic body of right brain or of the entire brain be in some sense the God from the view point of the brain? The TGD based interpretation for the vision of Jaynes about bicameral consiousness as a predecessor of modern consciousness would conform with this. The God of old testament would be the personal magnetic body which would not have yet become a highly integrated part of self and could be experienced as an outsider. Jaynes also proposes that the consciousness of schizophrenic is much like bicameral consciousness. It is not necessary to assume that the right amygdala is specialized to produce negatively colored motions and left amygdala positive emotions. Same applies also to the proposed roles of right and left hippocampi. In fact, according to Wikipedia article about lateralization of brain function depression is linked with hyperactive right hemisphere and selective involvement in "processing negative emotions, pessimistic thoughts and unconstructive thinking styles". A relatively hypoactive left hemisphere is said to be "specifically involved in processing pleasurable experiences" and "relatively more involved in decision-making processes". One can interpret this in many manners. The hyper-activity of right hemisphere could tend to cut its connection with its magnetic body and cause a depressive mood. Intense nerve pulse activity could cause this if nerve pulse generation breaks coherence of the EEG oscillation due to the oscillating membrane potentials inducing generation of signals to the magnetic body. The reduced neural activity of left hemisphere would mean a better connection to the magnetic flux tube and positive emotional coloring. Note that this picture conforms with spiritual practices which teach that the manner to achieve piece of mind and bliss is to stop thinking, which indeed means reduce neural activity and more stable connection to the magnetic body. If one takes this conceptualization seriously, one could conclude that the modern hectic society tends to split the connections to the personal magnetic bodies. Since they represent higher levels in the hierarchy of conscious entities, this would lead to a loss of spirituality and also social regression if magnetic bodies are responsible for social structures and cultural evolution. For about 26 years ago I had also a long-lasting "enlightment" experience - actually two of them. The general structure of these experiences fits with thde proposed general format. The first experience began with the experience of getting in contact with what I spontaneously called Great Mind. I started to make all kinds of questions which I imagined of writing to a monitor that I saw in front of me. Later I realized that the writing was not necessary. I also understood that our communication was severaly estricted by the fact that my language did not yet have words for to express the messages of this Great Mind so that the messages contained a lot of "blancos". I had an experience of profound understanding but did not know what I understood. I also felt that everything around me has extremely deep meaning. One of the first questions I did was "How long I will live?". From the humorous reply expressed as an endless rapid running of a counter containing a long sequence of digits I understood that there is no death. I also asked "Am I alone in this Universe?". The reply was enigmatic "You are a God!". Later it somehow became clear that this God like entity was actually in some sense me. A possible interpretation could be that a new higher layer to the hierarchy of layers of my personal magnetic body had emerged as this God like creature became a part of my personal magnetic body. Much later I realized that this paradoxical realization was the analog for Brahman=Atman identity of Eastern philosophies. Consider now the more technical assumptions. One can assume that right and left brain selves can entangle to form a single self and that magnetic flux tubes between brain hemispheres closely associated with the connecting nerve bundles serve as a correlate for this entanglement. In TGD framework the notion of negentropic entanglement makes sense and means entanglement entropy defined number theoretically is negative rather than being positive as usually. Negentropy Maximization Principle for quantum jumps guarantees the stability of negentropic entanglement. Entanglement probabilities must be rational or at most algebraic numbers or negentropic entanglement. The basic mechanism would be reconnection of magnetic flux tubes. Typically two parallel connecting flux tubes would touch each other and reconnect to form U-shaped flux tubes representing flux tubes beginning and returning to left (right magnetic body). What is the role of the external magnetic field in this process? Could the closed flux tubes of the external magnetic fields reconnect with those connecting the right hemisphere to left hemisphere. Suppose that magnetic flux tubes indeed serve as geometric correlates for attention interpreted as negentropic entanglement. Could one say that the magnet creating chirp signal catches the attention of the right brain magnetic body directed to the right hemisphere? Could the splitting of the connection to the magnetic body create the negative emotions. It is enough that the magnet- magnetic body entanglement becomes entropic to destroy the entanglement in state function reduction if one believes in NMP and perhaps this occurs. One an ask whether this kind of mechanism could explain also the effects of strong (or order 1 Tesla) fields on brain in transcranial magnetic stimulation or is the standard explanation in terms of eddy currents inducing nerve pulse patterns enough to explain the effects. Consider now a the general TGD inspired model explaining God helmet experiences. The magnetic chirp during the first stage tends to decouple the right hemisphere from its magnetic body and possibly also from the magnetic body of left brain. This alone creates the negatively colored emotions- kind of feeling of being abandoned by God. This could be also general mechanism of depression and the manner to cure depression would be re-establishment of this connection. At quantum level the cutting of the magnetic connection would mean the desctruction of entanglement between parts of the two brain hemispheres or between part of right hemisphere and its magnetic body temporarily. This would lead to the splitting of self to right and left brain sub-selves or the loss of the right hemisphere magnetic body entanglement. If one is ready to take seriously the notion of number theoretic entropy, the minimum condition would be that the magnetic chirp causes the entanglement probabilities become non-rational or even non-algebraic numbers so that the number theoretic entropy does not make sense. Ordinary entanglement entropy is always non-negative and state function reduction reduces the entanglement and self splits to two. During the second stage the simultaneous activation of both hemispheres by artificial neuronal signals derived from the EEG of amygdala and hippocampus would fuse both hemispheres to single coherent unit so that the mental images of the right hemisphere would contribute to the conscious experience. The coherence could increase from what it is during ordinary wake-up consciousness dominated by verbal communications. "Being nearer to God" alone could give rise to highly positived colored emotions and to a direct experience of seeing the God/light being/magnetic body and explain the experience of meaningfulness and deep understanding without being able to express what one understands. This inability could be simply to the lack of appropriate language. There is no need to assign this experience to the right hippocampus. For background and pdf version of the text see the new chapter TGD Based View about Classical Fields in Relation to Consciousness Theory and Quantum Biology of "TGD and EEG". Anyone - atheist or believer - wanting to learn about Persinger's work and the basic insights of neuro-theology should listen the extremely inspiring talk God and the Brain - The Persinger 'God Helmet', The Brain, and visions of God by Todd Murphy. Persinger's work (for refereces to the articles by Persinger and collaborators see the Wikipedia article about God helmet) suggests that the temporal pattern of the modulation of magnetic field strength (FM would be in question for slow variations) is important. We do not however know the "code". Also the strength of the magnetic field can be important. Note that the effects of very weak ELF em fields on vertebrate brain take place in amplitude windows. The modulation of magnetic field would probably induce FM of cyclotron frequencies. The model for hearing suggests this kind of modulation as a manner to represents the frequencies of the sound wave. Also phase information is very important: time reversed speech sounds very different as normal speech but has the same power spectrum. Modulations would be slow in the time scales defined by the audible frequency range. .1 seconds would represent lower limit for the variation rate of modulation. Audible frequencies above 20 Hz. God helmet or Koren helmet named after its inventor is the device used by Persinger and collaborators to study the effects of magnetic field on consciousness. Transcranial magnetic stimulation is not in question: TCMS uses fields of order Tesla whereas Persinger uses magnetic fields with strength of order .01 Gauss. This is 2 per cent of the nominal value of Earth's magnetic field. There is a coil above both temporal lobes and the active coil rotates counterclockwise. At the first stage the coil above right temporal lobe rotates counterclockwise. A chirp sequence is used. Chirp means use of an oscillating magnetic field with maximum amplitude about 1 microTesla with oscillation frequency going gradually down. The interpretation is that right-brain self is activated and dominates conscious experiences. The experiences have negative emotional coloring and sometimes the subject person has even fearful experiences. At second stage both coils rotate counterclockwise. The signal is derived from amygdala and hippocampal EEG. Faraday cage is used to eliminate external electromagnetic perturbations and also sensory deprivation is necessary (subject person is blind-folded and in an acoustic chamber). Earth's magnetic field is present, which might have relevance and is indeed used in experiments related to the hypothesis that the variations in Earth's magnetic field affect consciousness. A burst of left brain activity is reported to take place during second stage. Also visitor experience is reported to occur during this period. This can mean meeting of God/light being, of angels, of deceased or of group of "beings", or just sense the presence of some conscious entity. A strong sense of meaning can accompany the experience. 80 per cent of subjec persons experience at least the sense of presence. A more quantitative description of the God helmet experiment assuming that cyclotron frequencies are essential goes as follows. The field strength used by Persinger is of the order .01 Gauss and very weak and different from Bend=.2 Gauss which is .4BE with BE=.5 Gauss the nominal value of the Earth's magnetic field. Cyclotron frequencies are by a factor of order 1/20 smaller than for Bend. This gives .75 Hz for Ca++. From this it is clear that the changes of cyclotron frequencies would be small in static external field in Persinger's experiments and could be treated as a small perturbation. External magnetic field could superpose with Bend=.2 Gauss and affect cyclotron states and induce transitions between them. This would induce effects on EEG visible as frequency modulations. It seems that the period for the oscillation of B must be longer than cyclotron period for this picture to make sense. One expects a fractal hierarchy of field strengths for endogenous magnetic fields and B≈ .01 Gauss could correspond to higher levels of consciousness so that cyclotron frequencies for these fields would be important. In this case the external magnetic field would not be a small perturbation. The cyclotron frequencies of DNA strand carrying charge density of 2 elementary charges per nucleotide from the phosphates depend only weakly on the length of DNA strand and are about 1 Hz in Bend. Could the cyclotron radiation from cyclotron states associated with the external magnetic field induce interaction with DNA cyclotron states in field Bend=.2 Gauss? Consider next the time scales. The stimulation of right brain lasts during the first stage last about half an hour. There are however many lacking bits of data. In what range are the values of the rotation frequency for the magnetic field? ELf frequencies are used. If EEG frequencies are in question the rotation should be slower what the lowest EEG frequency involved and below 1 turn per second. The rotated magnetic field is time dependent. Chirp sequences are used to stimulate temporal lobe. What is the duration of single chirp and the frequency range covered during chirp? A good guess is that the frequency range is that of EEG. The natural expectation is that the duration of chirp is much longer than the periods in the frequency range considered. This would mean that one scan entire frequency range and that it makes sense to say that the changes of frequency during chirp is slow as compared to the instantaneous frequency. EEG signals from left amygdala or hippocampus are used to stimulate both temporal lobes during the second stage. This means that their natural frequency scale should be in the range 1-100 Hz. These time scales would be shorter than the time scale of order 1 second assignal to Ca++. This suggests that small aplitude modulation of the cyclotron frequencies in EEG range is in question. The signals sent to the magnetic body would be determined by this modulation and at least in the second stage this modification would carry information. Persinger's own explanation for the findings relies on what might be called neurotheology. The basic claim of Persinger is that the experiences in question are produced by brain so that meeting of God would not be real. Todd Murphy emphasizesthat it is actually impossible to conclude anything about the existence or non-existence of God on basis of these experiments. He however claims that evolution would have developed for brain the ability to produce visions of God which often accompany near death experiences and make it easier to accept the unavoidablity of the biological death. The reader can decide whether these two statements are consistent or not. The general idea is that both right and left amygdala, which are the most sensitive parts of the brain because the membrane potential is nearest to the threshold for nerve pulse generation. The right hippocampus is assumed to be responsible for non-verbal, "silent" thinking and left brain hemisphere to verbal thinking. This general picture is used by Todd Murphy to understand the conscious experiences accompanying death process about which near death experiences give a information. The experiences generated by God helmet during the first stage would be akin to the fearful emotions associated with near death experiences (NDE). The experiences during the second stage bring in mind the spiritual experiences accompanying death process and having strong positive emotional coloring. Persinger and Murphy propose that left amygdala is specialized to produce positive emotions (happiness, bliss, and even experience of encountering God or almost synonymously light being). Right amygdala would be specialized to produce negative emotions (such as fear and horror) and one can assign with it also depressive mood. This is not a generally accepted theory. If one accepts it, the natural question is whether right amygdala could serve as a kind of entropic dump pit and left amygdala as as a highly negentropic structure. The empirical data does not force the poor right amygdala to be a whole-daily sufferer. Consider now the explanation of the experiences induced by God helmet. The lecture by Todd Murphy helps considerably in attempts to understand the gist of the explanation and also helsp to see its problematic aspects. The selves of right and left brain fuse in some sense to form single self normally. The nerve bundles connecting the brain hemispheres allowing communications between them are essential for this integration. Right brain self is assumed to be sub-ordinate for left brain self. Magnetic pulses during the first period decompose self to two pieces: one could call them right and left self. During the first stage the mental images from the right brain self become dominating and fearful experiences are due to the fact that right brain amygdala, which is specialized to produce negative emotions, is hyper-active. This phase is believed to break the connection between left and right brain hemispheres. The anecdotal evidence by Todd Murphy suggests a correlation between non-verbal mood of consciousness and negative emotions. One must be however very cautious because extreme fear and horror alone might make impossible not only verbal communication but any coherent action. During the second stage both left and right brain are stimulated and expected contribute to the mental images of self when the connection between the hemispheres is intact. If I have understood correctly, the proposal is that the splitting of self to separate selves induced during the first phase is present almost permanently during the second phase and that left brain self dominates. The temporary "intrusion" of the right hemisphere self to the consciousness of left brain self would give rise to visitor experience. Intrusions would mean occasional re-establishment of the connection between hemispheres. One can question the assumption that God experience and the sensed presence represent instances of the same basic experience due to the intrusion. One could also argue that sensed presence is a signal for the breakdown of the connection and is created by the realization that there is also another self using the same biological body. The model of Todd Murphy for near death experiences would be that right amygdala can give rise to extremely frightening experiences but that the flow of the information to left amygdala transforms this experience to its emotional opposite. The right hippocampus suggested to be responsible for "silent" thinking would be responsible to the experiences of deep meaningfulness and of understanding. To my opinion this picture is too complex and involves too many ad hoc assumptions. Somehow my personal feeling is that this model is not quite correct. For instance, I do not understand the meaning "intrusion"? This could be of course be just my misunderstanding. Also the hypothesis about the specialization of left and right amygdala looks strange. In the next posting I will describe the TGD inspired interpretation of Persinger's findings. In TGD Universe gauge fields are replaced with topological field quanta. Examples are topological light rays, magnetic/electric flux tubes and sheets, and flux quanta carrying both magnetic and electric fields. Flux quanta form a fractal hierarchy in the sense that there are flux quanta inside flux quanta. It is natural to assume quantization of Kähler magnetic flux. Braiding and reconnection are the basic topological operations for flux quanta. The basic question is how the basic notions assigned with the classical gauge and gravitational fields understood in standard sense generalize in TGD framework. Superposition and interference of the classical fields is very natural in Maxwell electrodynamics and certainly experimentally verified phenomena. Also the notion of hologram relies crucially on the notion of interference. How can one describe the effects explained in terms of superposition of fields in a situation in which the theory is extremely non-linear and all classical gauge fields are expressible in terms of CP2 coordinates and their gradients? It is also rather clear that the preferred extremals for Kähler action decompose to space-time regions representing space-time correlates for quanta. The superposition of classical fields in Maxwellian sense is impossible. How can one cope with this situation? The answer is based on simple observation: only the effects of the classical fields superpose. There is no need for the fields to superpose. Together with the notion of many-sheeted space-time this leads to elegant description of interference effects without any need to assume that linearization is a good approximation. Topological quantization brings in also braiding and reconnection of magnetic flux tubes as basic operations for classical fields. These operations for flux tubes have also Maxwellian counterparts at the level of field lines. Braiding and reconnection are in a central role in TGD Universe and especially so in in TGD inspired theory of consciousness and quantum biology. The challenge is to build a coherent overall phenomenological view about the role of topologically quantized classical fields in biology and neuroscience. For instance, one can ask what is the precise formulation for the notion of conscious hologram and whether magnetic flux tubes could serve as correlates of entanglement (or at least negentropic entanglement suggested by the number theoretic vision and identified as a basic signature of living matter). Topological quantization and the notion of magnetic body are especially important in TGD inspired model of EEG. The attempt to understand the findings of Persinger from the study of what is known as God helmet leads to a considerable progress in the understanding the possible role of topologically quantized classical fields in biology and neuro-science. I do not bother to type more and instead give a link to the article TGD based view about classical fields, consciousness theory, and quantum biology. In earlier posting Comparison of Maxwellian and TGD views about classical gauge fields I compared Maxwellian and TGD based notions of classical fields. The comparison was restricted to the linear superposition of fields which in TGD framework is restricted to linear superposition of effects of classical fields: the space-time sheets representing classical fields are indeed separate and it is enough that their M4 projections intersect. Summation of effects means at classical level summation of forces caused by them due to the fact that particles have topological sum contacts to both space-time sheets. The notion of hologram relies crucially on the superposition of fields and this this forces to reformulate the notion of hologram in TGD framework. In TGD inspired theory of consciousness the idea about living system as a conscious hologram is central. It is of course far from clear what this notion means. Since the notions of interference and superposition of fields are crucial for the description of the ordinary hologram, the proposed general description for the TGD counterpart for the superposition of fields is a natural starting point for the more precise formulation of the notion of conscious hologram. In the following only the notion of conscious hologram is discussed. Also the formulation of the notion of ordinary hologram in TGD framework is an interesting challenge. Consider ordinary hologram first. Reference wave and reflected wave interfere and produce an interference pattern to which the substrate of the hologram reacts so that its absorption coefficient is affected. When the substrate is illuminated with the conjugate of the reference wave, the original reflected wave is generated. The modification of the absorption coefficient is assumed to be proportional to the modulus squared fro the sum of the reflected and reference waves. This implies that the wave reflected from the hologram is in good approximation identical with the original reflected wave. Conscious hologram would be dynamical rather than static. It would be also quantal: the quantum transitions of particles in the fields defined by the hologram would be responsible for the realization of the interference pattern as a conscious experience. The previous considerations actually leave only this option since the interference of classical fields does not happen. Reference wave and reflected wave correspond now to any field configurations. The charged particles having wormhole contacts to the space-time sheets representing the field configurations experience the sum of the fields involved, and this induces quantum jumps between the quantum states associated with the situation in which only the reference wave is present. This would induce a conscious experience representing an interference pattern. The reference wave can also correspond to a flux tube of magnetic body carrying a static magnetic field and defining cyclotron states as stationary state. External time dependent magnetic field can replace reflected wave and induces cyclotron transitions. Also radiation fields represented by MEs can represent the reference wave and reflected wave. If there is need for the "reading" of the hologram it would correspond to the addition of a space-time sheet carrying fields which in good approximation have opposite sign and same magnitude as those in the sheet representing reference wave so that the effect on the charged particles reduces to that of the "reflected wave". This step might be un-necessary since already the formation of hologram would give rise to a conscious experience. The conscious holograms created when the hologram is created and when the conjugate of the reference wave is added give rise to two different conscious representations. This might have something to do with holistic and reductionistic views about the same situation. One can imagine several realizations for the conscious hologram. It seems that the realization at the macroscopic level is essentially four-dimensional. By quantum holography it would reduce at microscopic level to a hologram realized at the 3-D light-like surfaces defining the surfaces at which the signature of induce metric changes (generalized Feynman diagrams having also macroscopic size - anyons or space-like 3-surfaces at the ends of space-time sheets at the two light-like boundaries of CD. Strong form of holography implied by the strong form of general coordinate invariance requires that holograms correspond to collections of partonic 2-surfaces in given measurement resolution. This could be understood in the sense that the charged particles defining the substrate can be described mathematically in terms of the ends of the corresponding light-like 3-surfaces at the ends of CDs. The cyclotron transitions could be thought of as occurring for particles represent as partonic 2-surfaces topologically condensed at several space-time sheets. One can imagine several applications in TGD inspired quantum biology. One can develop a model for how certain aspects of sensory experience could be understood in terms of interference patterns for signals sent from the biological body to the magnetic body. The information about the relative position of the magnetic body and biological body would be coded by the interference patterns giving rise to conscious sensory percepts. This information would represent geometric qualia giving information about distances and angles basically. There would be a magnetic flux tube representing the analog of the reference wave and magnetic flux tube carrying the analog of reflected wavel which could represent the effect of neural activity. When the signal changes with time, cyclotron transitions are induced and conscious percept is generated. In principle it there is no need not compensate for the reference wave although also this is possible. The natural first guess is that EEG rhythms (and those for its fractal generalization) represent reference waves and that the frequencies in question are either harmonics of cyclotron frequencies or linear combinations of these and Josephson frequency assignable to cell membrane (and possibly its harmonics). The modulation of membrane potential (membrane is regarded as a super-conductor) would induce modulations of Josephson frequency and if large enough would generate nerve pulses. These modulations would define the counterpart of the reflected wave. The flux tubes representing unperturbed magnetic field would represent reference waves. For instance, the motion of the biological body changes the signal at the space-time sheets carrying the signal and this generates cyclotron transitions giving rise to a conscious experience. Perhaps the sensation of having a body is based in this mechanism. The signals could emerge from directly from cells: it could be that this sensation corresponds to lower level selves rather than us. Second option is that nerve pulses to brain induce the signals sent to the our magnetic body. The motion of biological body relative to biological body generates virtual sensory experience which could be responsible for the illusions like train illusion and the unpleasant sensory experience about falling down from cliff by just imagining it. OBEs could be also due to the virtual sensory experiences of the magnetic body. One interesting illusion results when one swims long time in windy sea. When one returns to the shore one has rather long lasting experience of being in sea. Magnetic body gradually learns to compensate the motion of sea so that the perception of the wavy motion is reduced. At the shore this compensation mechanism however continues to work. This mechanism represents an example of adaptation and could be a very general mechanism. Since also magnetic body uses metabolic energy, this mechanism could have justification in terms of metabolic economy. Also thinking as internal, silent speech might be assigned with magnetic body and would represent those aspects of the sensory experience of ordinary speech which involve the quantum jumps at magnetic body- the associated geometric qualia- but not the primary sensory percept. This speech would be internal speech since there would be no real sound signal or virtual sound signal from brain to cochlea. Conscious hologram would make possible to represent phase information. This information is especially important for hearing. The mere power spectrum is not enough since it is same for speech and its time reversal. Cochlea performs an analysis of sounds to frequencies. It it is not easy to imagine how this process could preserve the phase information associated with the Fourier components. It is believed that both right and left cochlea are needed to abstact the phase difference between the signals arriving to right and left ear allowing to deduce the direction of the source neural mechanisms for this has been proposed but these mechanism are not enough in case of speech. Could there exists a separate holistic representation in which sound wave as a whole generates a single signal interfering with the reference wave at the magnetic body and in this manner represents as a conscious experience the phase? Also the control and reference signals from the magnetic body to biological body could create time dependent interference patterns giving rise to neural response initiating motor actions and other responses. Basically the quantum interference should reduce the magnitude of membrane resting potentials so that nerve pulses would be generated and give rise to motor action. Similar mechanism would be at work at the level of sensory receptors - at least retina. The generation of nerve pulses would mean kind of emergency situation at the neuronal level. Frequency modulation of Josephson radiation would be the normal situation. For background see the chapter General View About Physics in Many-Sheeted Space-Time : Part I.
Peter Woit told in his "This Week's Hype" series about a press release titled The mechanism that explains why our universe was born with 3 dimensions: a 40-year-old puzzle of superstring theory solved by supercomputer. Peter Woid gives a long citation of the hype and also discusses the background. I encountered a New Scientist article about this hype already few weeks ago and got so irritated that almost decided to write a blog posting but managed to calm down myself. The challenge of a theoretician working with higher dimensions is to explain why our world seems to be 4-dimensional. No explanation for this fact has emerged in super string models: Kaluza-Klein approach led to Calabi-Yau's but led to the landscape catastrophe. Also 3-dimensional branes have been proposed to be in special role. The recent "solution" of the problem is actually rewarming of an old Kaluza-Klein spirited proposal. The idea is that somehow the symmetry-group of 10-dimensional space would reduce to SO(3) and this could be interpreted as isometries of 3-D Euclidian space. What the Japanese group has done are lattice calculations for what they call Matrix model, which is one of the extremely fuzzy variants of M-theory. It is suggested to provide nothing less than a non-perturbative formulation of M-theory. In TGD framework the explanation for both the dimension 8 of imbedding space and the dimension D=4 of its Minkowski space factor and the dimension D=4 of space-time surface images from symmetry considerations. The world of classical worlds (space-time surfaces identified as preferred extremals of Kähler action) has Kähler geometry only if it has infinite-D isometry group. The conformal symmetries of the light-like 3-surfaces defining the surfaces at which the induce metric changes its signature and at the same time also generalized Feynman graphs extend the ordinary 2-D conformal symmetries and one obtains infinite-D isometr group. This is possible only for 4-D space-time surfaces. Also the light-cone boundary of light-cone of 4-D Minkowski space has extended conformal symmetries so that 4-D Minkowski space is unique. There are also other reasons- in particular those related to the dimensions of classical number fields selecting these dimensions and M4× CP2. It is of course useless to tell this to the colleagues: they refuse to listen to a pariah and prefer to contine beating their intelligent heads on the wall. The weird activities with Matrix represent only one example of this acticity. I decided to check what Matrix model means -if anything- and found an article by Tom Banks and some others about Matrix model. It is Christmas Eve so that I want to put it mildly: my feelings were mixed. There are long sequences of hand waving arguments before one ends up with what is christened as Matrix model. One begins with M-theory and considers branes, which as such are very questionable objects physically. One suddenly decides that 0-branes representing point-like particles are fundamental rather than strings which would be analogous to 1-branes. All higher dimensional branes would be constructed from 0-branes. This would mean return to old days when particles where point-like. But do let this to disturb you. It is good to change the liturgy sometimes. After this one puts an infinite number of 0-branes- point like particles- on top of each other at same point of 10-D space-time. Like putting infinite-number of point like particles on top of each other. Stay calm and trust the M-theoretician. He knows. Then M-theoretician tells that AdS-correspondence says that the 10 coordinates assignable to the the points form actually matrices in SU(N)×U(1) at the limit of infinite N so that the 10 coordinates have become 10 non-commutating matrix valued coordinates. If you have difficulties swallowing this remember that everyone learns that you are an imbecille with an intelligence quotient of amoeba if you say this aloud. The AdS/CFT approach relies on the physical idea that the particles at different branes defined U(1) factors of gauge group. If the branes in the stack carry fermionic single particle states states one can indeed construct from them generators of SU(N)×U(1). This idea does not look non-sense to me: for finite number of N it might indeed give rise to a dynamical gauge group having interpretation as gauge symmetry allowing to describe finite measurement resolution in TGD framework. This however gives rise to gauge potentials with non-commutative gauge group, not non-commutative coordinates of 10-D space-time. This is a little problem- actually not so little - but let us trust M-theoreticians and identify vector potentials with 10-D space-time coordinates. M-theoretician decides that the dynamics of everything is dictated by Yang-Mills Hamiltonian restricted to the world line of the stack of 0-branes. It should be possible to replace Yang-Mills Hamiltonian with corresponding Lagrangian and I shall indeed do this in the sequel to see what results. This is the theory of everything in non-perturbative formulation! Certainly simple as will be found but to me- a crackpot with intelligence quotient of amoeba - this looks complete non-sense physically. The Japanese research group responsible for the hype has taken all this seriously and decided to do computer simulations. The value of N is replaced with a finite value for approximation purposes. One decides that Kaluza-Klein compactification to 4-D space-time takes places if symmetry breaking takes place reducing SO(9) as rotational symmetries to SO(3). The claim is that numerical calculations show that this happens. Just for fun I decided to check what YM Lagrangian in 1-D time-line would give. The field equations express the vanishing of non-Abelian gauge currents. Gauge condition is naturally A0=0 corresponding to vanishing of the time component of gauge potential. There would be no time in this Universe but let us not bet worried. One can write YM equations and they state the vanishing of YM currents: Jα=0. J0=0 can be solved exactly and the solutions says that the other components of the potential are like the coordinates of a free particles Ai= xi(0)+vi(0) t. Particle interpretation happens to make sense except that time is constant. Classically the conditions Ji=[Aj,[Ai,Aj]]=0 give for matrix conditions on initial values of xi(0) and vi(0). Four conditions for each component corresponding to powers tn, n=0,1,2,3. These equations are symmetric under the exchange of positions and momenta- kind of duality. Classically they represent infinite number of polynomial equations of third order in variables xi(0) and pi(0) restricting the motion to an algebraic surface in infinite-D space of 9-vectors with matrix valued components. The polynomials are homogenous so that scalings of initial values are symmetries. An interesting ansatz consist of restricting the vector potentials to subgroup of U(∞). One obtains infinite hierarchy of solutions for which the motion of pseudo particle takes place in finite-dimensional subgroup U(n) or its subgroup. As a special case on also obtains solutions which correspond to Cartesian products ∏ U(ni). The interpretation as N-particle solutions is attractive. For Cartesian powers of U(1):s the constraints are identically satisfied. For Cartesian powers of SU(2) one obtains what looks like particles in 3-space with coefficients of Lie-algebra generators of SO(3) interpreted as coordinates of 3-space. The classical solvability apart from constraints suggests that also the quantized variant of the theory is solvable. Let us assume that wave functions are in the space defined by initial values xi(0). The standard commutation relations for the matrix elements of Ai and pi= dAi/dt= pi(0) reduce to those for xi(0) and pi(0). The matrix elements of these matrices are just like the position and momentum coordinates for free particle in Euclidian space. The conditions Ji=0 reduces to four sets of equations corresponding to powers n=0,1,2,3 of t. n=0 gives infinite number of third order polynomial equations for initial values of xi(0). n=1 gives second order partial differential equations linear in xi(0). n=2 gives gives first order partial differential equations quadratic in xi(0). n=3 gives infinite numer of third order partial differential equations in pi(0). Also in the quantum one has the hierarchy of solutions assignable to subgroups of U(∞) and their Cartesian products. If one wants something like emergent 3-space I would assign it to wave functions corresponding to the Cartesian powers of SU(2). I would try to show that the constraints favor this kind of solutions and that for higher dimensions of SU(N) or its subgroups the number of conditions is too large. I would also ask whether the fact that SU(2) Lie-algebra is in some sense the building brick of higher dimensional Lie algebras as the general form of the presentation of Lie algebras demonstrates could somehow mean that also more complex solutions are perturbations of those for Cartesian powers of SU(2). These questions are useful but it turns out that another 3-D Lie algebra- Heisenberg algebra- seems to be more interesting as effective gauge algebra. Are the resulting quantum equations sensible? For simplicity one can consider solutions restricted to SU(2) subgroup in the sense that the subgroup of U(∞) is N:th Cartesian power of SU(2) with interpretation in terms of N-particle state. There are 3× 9=27 coordinates xi(0). There are 3× 9 equations for n=0. The naive conclusion consistent with the scaling invariance and counting the number of conditions is that the only solution is xi(0)=0. This conclusion is too hasty. One can have solutions for which xi is restricted to 1-D subspace of E9. In this case the conditions expressible in terms of 3-D cross product are identically satisfied since cross products vanish. In this case the situation is indeed 3-dimensional and one can say that solution describes a pointlike free particle moving in 3-D space defined by the SU(2) Lie algebra valued preferred coordinate of E9. I have failed to to find more general solutions to the conditions. One can also consider wave functions restricted to 1-dimensional sub-manifolds of E9. Constraint conditions are identifically satisfied since the operators corresponding to n=1,2,3 vanish identically. The dimension of the higher dimensional space place no role since everything depends on the 3-D cross product characterizing quaternions and making SU(2) as a gauge group unique. The overall wave function would be restricted to a 2-D plane M2 of M10. Amusingly, in TGD framework preferred planes M2 of M4 play a key role. The effectively one-dimensional solutions exist for any matrix algebra since gauge field vanishes identically and therefore also gauge current. Hence SU(2) is not in special position. One obtains effectively 3-dimensional solution ansatz by restricting the consideration to 3-D subspace of E9. This implies that the algebra generated by Ai is a matrix representation of Heisenberg algebra and the Lie algebra of gauge group is replaced by non-compact Heisenberg group. Finite-dimensional representations of this algebra are non-unitary but infinite-dimensional representations can be unitary. For n=3 the equations are also identically satisfied by the Heisenberg algebra property. The equations for n=1 and n=2 one obtains conditions on the wave function. Heisenberg algebra characterizes harmonic oscillator and for the vacuum state the condition that annihilation operator creates vacuum can be regarded as the analog of this conditions. On physical grounds one expects something like harmonic oscillator wave functions. Could one apply the analog of standard quantization meaning that the wave functions depend only on single coordinate -say that associated with x1(0). so that the conditions on Ψ reduce to those for n=0 and are identically satisfied by Heisenberg algebra property. This kind of condition is also analogous to a covariant constancy condition and makes sense for single coordinate. The value of the parameter k characterizes the width harmonic oscillator Gaussian (scale of energy spectrum for harmonic oscillator). What is interesting is that one would have something analogous to what happens in TGD. The solution would be 3-dimensional and its time evolution would span a 4-D subspace. Uncertainy Principle for Heisenberg algebra would allow the wave function depend on single coordinate and one would effectively have 2-dimensional plane. Whether it makes sense to generalize the solution ansatz so that the linear 3-D subspaces of E9 are replaced with more general 3-D sub-manifolds is not clear. A more general solution ansatz is obtained by considering the Cartesian powers of 3-D Heisenberg algebra. One obtains also solutions for which Qi= Ai, i=1,...,4 and Pi=Ai, i=5,...,8 commute the identity matrix in the generalization of Heisenberg algebra generated by the phase space coordinates Qi and Pi. Again unitary representations are infinite-dimensional. In this case the harmonic oscillator wave function would be effectively 4-dimensional. Could one think of D=4 gauge theory at the limit when the dimension N of gauge group approaches infinity. Just for Christmas fun let us assume that it is literally infinite and apply the idea that the gauge potentials form a 3-D Heisenberg algebra. with other commutators vanishing. This condition makes sense for Hermitian fields strength in an infinite-D representation of Heisenberg algebra using infinite-D unitary gauge group. The new element is the interpretation of gauge potentials as generators of local Lie-algebra representable as Hermitian objects in infinite-D unitary gauge algebra. Consider first the vanishing of J0. The expression of the electric field strength reduce by gauge condition to F0i = -∂tAi and is identical to that of Abelian gauge field theory. What about the equations stating the vanishing of Ji? In this case the Heisenberg algebra guarantees the vanishing of the trilinear terms in the currents. The gauge field strengths F13 and F23 reduce also to their Abelian expressions. F12= ∂2A1 -∂1A2+mA3. Field equations stating the vanishing of J3 are Maxwellian. In J1=0 ( J2=0) the term m∂2A3 (-m∂1A3) appears as effective source term so that the field serves as a linear sources for itself. Again one might apply the analogy with harmonic oscillator and argue that the wave functions in the space of field configurations can depend only on single component of gauge potential- say A1. The interpretation would be in terms of polarization direction. The special role of A3 corresponds to the direction of 3-momentum in gauge theory. Also now Cartesian powers of Heisenberg algebra are possible and one obtains the analogs of many-particle states with varying directions of polarizations. One can assign to the solution also a preferred plane of M2 defined by time axes and the preferred component of gauge potential. With a good will one might say that M2 is analogous to string world sheet. One can ask whether symplectic transformations in E2 could give rise to more general solutions with a local polarizaion direction. What would be non-trivial is that the field equations would linearize completely by using Heisenberg algebra ansatz and the otherwise difficult-to-treat local non-linearity would reduce to well-understod local Lie algebra commutations. What can one conclude from this exercise? A rather general solution ansatz is expressible as a product solution corresponding to N:th Cartesian power of U(1). For U(1) factors the solutions can be said to be 9-dimensional since there are no constraints on the 9 coordinates xi(0). Another solution -even more trivial - solution ansatz reduces to 1-dimensional sub-space of E9 and has vanishing gauge field strength for any gauge algebra. Constraint equations are trivially satisfied. A genuinely 3-dimensional solution ansatz is obtained if one allows the gauge potentials to generate 3-D Heisenberg algebra. If the matrix algebra is infinite-dimensional, sub-algebra of U(&infty;), the matrices in question can be made unitary. Solution ansatz seems to work if one performs standard quantization in Heisenberg algebra so that wave functions depend on single coordinate xi only. This solution ansatz generalizes by replacing the Heisenberg group with its Cartesian power. The idea that 3-D space somehow emerges from Matrix theory is based on the reduction of isotropy group from SO(9) ⊂set; SO(1,9) to SO(3). One might perhaps say that for the Heisenberg ansatz 3-dimensionality is obtained in this sense. Heisenberg group acts as gauge group. When the Cartesian power of Heisenberg group, the solution could be seen as describing free particles moving in 3-D space. The Lagrangian variant of the Matrix model is a nice toy model but to my opinion has very little to do with physics. TGD SUSY in its simplest form assumes that covariantly constant right-handed neutrino generates SUSY. The second purely TGD based element is that squarks would correspond to the same p-adic mass scale as partners. This looks nice but there are objections. The first objection relates to the tachyonicity needed to get rid of double degeneracy of light mesons consisting of u, d, and s quarks. Mesons and smesons consisting of squark pair mix and for large αs the mixing is large and can indeed make second eigenvalue of the mass squared matrix negative. If so, these states disappears from spectrum. At least to me this looks however somewhat unaesthetic. Luckily, the transformation of second pion-like state to tachyon and disappearance from spectrum is not the only possibility. After a painful search I found experimental work claiming the existence of states analogous to ordinary pion with masses 60, 80, 100, 140,.... MeV. Also nucleons have this kind of satellite states. Could it be that one of these states is spion predicted by TGD SUSY for ordinary hadrons? But what about other states? They are not spartners: what are they? The second objection relates to the missing energy. SUSY signatures involving missing energy have not been observed at LHC. This excludes standard SUSY candidates and could do the same in the case of TGD. In TGD framework the missing energy would be eventually right handed neutrinos resulting from the decays of sfermions to fermion and sneutrino in turn decaying to neutrino and right handed neutrino. The naive argument is that shadronization would be much faster process than the decay of squarks to quarks and spartners of electro-weak gauge bosons and missing energy so that these events would not be observed. Shadrons would in turn decay to hadrons by gluino exchanges. The problem with this argument is that the weak decays of squarks producing right handed neutrinos as missing energy are still there! This objection forces to consider the possibility that covariantly constant right handed neutrino which generates SUSY is replaced with a color octet. Color excitations of leptons of leptohadron hypothesis would be sleptons which are color octets so that SUSY for leptons would have been seen already at seventies in the case of electron. The whole picture would be nicely unified. Sleptons and squark states would contain color octet right handed neutrino the same wormhole throats as their em charge resides. In the case of squarks the tensor product 3⊗ 8=3+6bar+15 would give several colored exotics. Triplet squark would be like ordinary quark with respect to color. Covariantly constant right-handed neutrino as such would represent pure gauge symmetry, a super-generator annihilating the physical states. Something very similar can occur in the reduction of ordinary SUSY algebra to sub-algebra familiar in string model context. By color confinement missing energy realized as a color octet right handed neutrino could not be produced and one could overcome the basic objections against SUSY by LHC. What about the claimed anomalous trilepton events at LHC interpreted in terms of SUSY, which however breaks either the conservation of lepton or baryon number. In have proposed TGD based interpretation is in terms of decays of W to sW and sZ which in turn decay and produce the three lepton signature. Suppose that sW and sZ are color octets and that sleptons replace the color octet excitations of leptons responsible for leptohadron physics. One possible decay chain would involve the decays sW+→ sL++νbar and sZ→ L++sL-. Color octet sleptons pair combine to form leptopion which decays to lepton pair. This decay cascade would produce missing energy as neutrino and this seems to be the case for other options too. This view about TGD SUSY clearly represents a hybrid of the two alternative views about X and Y bosons as composites of either color excitations of quarks or of squarks and is just one possibility. The situation is not completely settled and one must keep mind open. The reader can find details in the article Do X and Y mesons provide evidence for color excited quarks or squarks? or in the chapter New Particle Physics Predicted by TGD: Part I. In TGD Universe gauge fields are replaced with topological field quanta. Examples are topological light rays, magnetic flux tubes and sheets, and electric flux quanta carrying both magnetic and electric fields. Flux quanta form a fractal hierarchy in the sense that there are flux quanta inside flux quanta. It is natural to assume quantization of Kähler magnetic flux. Braiding and reconnection are basic topological operations for flux quanta. One important example is the description of non-perturbative aspects of strong interactions in terms of reconnection of color magnetic flux quanta carrying magnetic monopole fluxes. These objects are string like structures and one can indeed assign to them string world sheets. The transitions in which the thickness of flux tube increases so that flux conservation implies that part of magnetic energy is liberated unless the length of the flux quantum increases, are central in TGD inspired cosmology and astrophysics. The magnetic energy of flux quantum is interpreted as dark energy and magnetic tension as negative "pressure" causing accelerated expansion. This picture is beautiful and extremely general but raises challenges. How to describe interference and linear superposition for classical gauge fields in terms of topologically quantized classical fields? How the interference and superposition of Maxwellian magnetic fields is realized in the situation when magnetic fields decompose to flux quanta? How to describe simple systems such as solenoidal current generating constant magnetic field using the language of flux quanta? The basic question concerns the elegant description of superposition of classical fields in terms of topological field quanta. What it means that magnetic fields superpose. In Maxwell's linear theory the answer would be trivial but not now. Linear superposition holds true only inside topological light rays for signals propagating in fixed direction with light velocity and with same local polarization. The easy solution would be to say that one considers small perturbations of background space-time sheet and linearizes the theory. Linearization would apply also to induced gauge fields and metric and one would obtain linear superposition approximately. This does not look elegant. Rather, quantum classical correspondence requires the space-time counterpart for the expansion of quantum fields as sum of modes in terms of topological field quanta. Topological field quanta should not lose their identity in the superposition. In the spirit of topological field quantization it would be nice to have topological representation for the superposition and interference without any linearization. To make progress one must return to the roots and ask how the fields are operationally defined. One has test particle and it experiences a gauge force in the field. From the acceleration of the test particle the value of field is deduced. What one observes is the superposition of gauge forces, not of gauge fields. Let us just assume that we have two space-time sheets representing field configurations to be effectively superposed. Suppose that they are "on top" of each other with respect to CP2 degrees of freedom so that their M4 volumes overlap. The points of the sheets representing the field values that would sum in Maxwell's theory are typically at distance of CP2 radius of about 104 Planck lengths. Wormhole contacts representing he interaction between the field configurations are formed. Hence the analog of linear superposition does not hold true exactly. For instance, amplitude modulation becomes possible. This is however not essential for the argment. Test particle could be taken to be fermion which is simultaneously topologically condensed to both sheets. In other words, fermionic CP2 type almost vacuum extremal touches both sheets and wormhole throats at which the signature of the induced metric changes is formed. Fermion experiences the sum of gauge forces from the two space-time sheets through its wormhole throats. From this one usually concludes that superposition holds true for the induced gauge fields. This assumption is however not true and is also un-necessary in the recent case. In case of topological light rays the representation of modes in given direction in terms of massless extremals makes possible to realize the analogy for the representation of quantum field as sum of modes. The representation does not depend on approximate linearity as in the case of quantum field theories and therefore removes a lot of fuzziness related to the quantum theory. In TGD framework the bosonic action is indeed extremely non-linear. This view about linear superposition has interesting implications. In effective superposition the superposed field patterns do not lose their identity which means that the information about the sources is not lost - this is true at least mathematically. This is nothing but quantum classical correspondence: it is the decomposition of radiation into quanta which allows to conclude that the radiation arrives from a particular astrophysical object. It is also possible to have superposition of fields to zero field in Maxwellian sense but in the sense of TGD both fields patterns still exist. Linear superposition in TGD sense might allow testing using time dependent magnetic fields. In the critical situation in which the magnetic field created by AC current passes through zero, flux quanta have macroscopic size and the direction of the flux quantum changes to opposite. An interesting challenge to describe time dependent fields in terms of topological field quanta which are in many respects static structures (for instance, flux is constant). The magnetic fields created by time dependent currents serves as a good example from which one can generalize. In the simplest situation the magnetic field strength experiences time dependent scaling. How to describe this scaling? Consider first the scaling of the magnetic field strength in flux tube quantization. Intuitively it seems clear that the field decomposes into flux quanta, whose M4 projections can partially overlap. To get a connection to Maxwell's theory one can assume that the average field intensity is defined in terms of the flux of the magnetic field over a surface with area S. For simplicity consider constant magnetic field so tht one has BaveS= Φ= nΦ0, where Φ0 is the quantized flux for a flux tube assumed to have minimum value Φ0. Integer n is proportional to the average magnetic field Bave. Bave must be reasonably near to the typical local value of the magnetic field which manifest itself quantum mechanically as cyclotron frequency. What happens in the scaling B→ B/x. If the transversal area of flux quantum is scaled up by x the flux quantum is conserved. To get the total flux correctly, the number of flux quanta must scale down: n → n/x. One indeed has (n/x)× xS= nS. This implies that the total area associated with flux quanta within total area S is preserved in the scaling. The condition that the flux is exact integer multiple of Φ0 would pose additional conditions leading to the quantization of magnetic flux if the total area can be regarded as fixed. This need not to be true. Consider as the first example slowly varying magnetic field created by an alternating running in current in cylindrical solenoid. There are flux tubes inside the cylindrical solenoid and return flux tubes outside it flowing in opposite direction. Flux tubes get thicker as magnetic field weakens and shift from the interior of solenoid outside. For some value x of the time dependent scaling B→ B/x the elementary flux quantum Φ0 reaches the radius of the solenoid. Quantum effects must become important and make possible the change of the sign of the elementary flux quantum. Perhaps quantum jump turning the flux quantum around takes place. After this the size of the flux quantum begins to decrease as the magnitude of the magnetic field increases. At the maximum value the size of the flux quantum is minimum. This example generalizes to the magnetic field created by a linear alternating current. In this case flux quanta are cylinderical flux sheets for which magnetic field strength and thickness oscillators with time. Also in this case the maximum transversal area to the system defines a critical situation in which there is just single flux sheet in the system carrying elementary flux. This flux quantum changes its sign as the sign of the current changes. The comments of Lubos and Andrew Oh-Willeke to blog posting about LHC data release inspired some comments on my side. These hastily typed comments were imprecise and I decided to write an improved version collecting the main points to a more organized structure. I want also to write about these topics to clarify to myself some important open issues in my own approach and I will do my best to debunk myself in the following. I will very probably make imprecise and even wrong statements. This is work in progress. Apologies. The basic issue is whether the signal at LHC is a compelling evidence for Higgs or not. My claim is that it tells only that there is scalar or pseudo-scalar producing the signal and that under rather general assumptions this signal can be even quantitatively equivalent with the Higgs signal for the recently studied signatures. Enthusiasts also forget that the signal cross section has features which do not favor its interpretation in terms of Higgs. Exclusion of Higgs does not mean the exclusion of signal! The clear structures around 135 and 145 GeV have not disappeared, there is a wide bump like structure in the entire region 110-150 GeV, and there is structure at both sides of 300 GeV. All these structures should disappear with increased statistics if Higgs interpretation is correct. We do not know whether this will happen and the natural question is whether one could interpret these structures by replacing Higgs paradigm with something else. Higgs is also disfavored by profound theoretical reasons. It is just around the border of instability against the decay of vacuum. Could this criticality be a signal about the need to replace Higgs with something else? Presumably a microscopic description of particle massivation (provided by TGD already 15 years ago in terms of p-adic thermodynamics). Or are we happy with Higgs phenomenology which only reproduces instead of predicting? The main results hitherto - preliminary of course - are following. Various decay rates of pion like states of M89 hadron physics can be estimated using the generalization of partially conserved axial vector hypothesis (PCAC) stating that the divergence of the axial vector current is proportional to pion field. The proportionality constant is fπmπ2. The divergence of axial current equals to the sum of instanton densities for electro-weak gauge fields and color gauge field plus the divergence of axial vector currents for u and d type quarks assuming that they are massive: this divergence is by Dirac equation proportional to the mass of the quark. The contribution of more massive quarks is absent, which is quite a remarkable difference as compared to the standard model Higgs for which the decay amplitudes to massive quark pairs are the most important ones by the proportionality of Higgs-fermion coupling to quark mass. This holds true in M4 effective QFT picture: one can hope that it is a good approximation. It is is indeed known to work in orfdinary low energy hadron physics and p-adic fractality suggests that the same holds true for M89 hadron physics . If the generalization of hadronic sigma model involving u and d type is accepted then fπ can be identified as the negative of the vacuum expectation value of sigma field: fπ=-v. The inspection of the decay rates of Higgs in standard model and those predicted by PCAC /Iztykson-Zuber is my source) shows that their structure is identical. This strongly suggests that by replacing Higgs vacuum expectation value by a suitable multiple of sigma field vacuum expectation it might be possible to reproduce all decay rates of standard model Higgs. This would apply also at the level of amplitudes. This kind of duality like relation would not be terribly surprising since the structure of these two models is very similar. This would allow to estimate the decay rates of pionlike state to various channels and have very similar results for the decay rates to weak gauge bosons and also to the states produced via the decay to virtual gauge boson pair decaying to quarks or leptons. The direct decays to other than u and d quark pairs do not appear in the lowest order. Assuming X=fπ/mπ=91/140= .65 as for ordinary pion, the decay of pion-like state to gamma pair implied by PCAC is under very natural assumptions by a factor 1.54 times larger that the decay reate of Higgs. The observed signal cross section for gamma pair production by 125 GeV state is by the same factor about 1.5 higher than that predicted by the standard model! The magnitude of fπ=-v= -81.3 GeV is very near to W boson mass 80.4 GeV. fπ=-mW would give m(π89)= 123.6 GeV which is second favored value for the mass of the resonance. This does not yet allow to shout Heureka! and claim that M89 pion hypothesis beats Higgs hypothesis. The production rates for Higgs and pion like state need not be the same. If however the production by fusion of electroweak bosons and gluons dominates and is described by PCAC (action would be just then one has excellent hopes that the production rates are indeed identical. There is also associated production in which W or Z boson emitted by a scattered quark in either proton emits Higgs boson. Also this vertex would be governed by PCAC when Higgs is replaced by M89. The experimental data suggests that Higgs signal is much smaller than the predicted signal above 127 GeV but has bump like structure and at bumps larger than the effective signal from the standard model background. Also the p value telling the probability that standard model background is able to explain the signal cross section has sharp downwards peaks at two other masses about 127 GeV. TGD interpretation would be in terms of pion like states. This interpretation makes sense only if the proportionality coefficient X in fπ=-X mπ is considerably large than its value for ordinary pion and lowest pion like state given by Z= 91/140∼1.54. This reduces the various couplings of pion like state by a factor 1/X2. This is of course possible but one should have a good explanation for why X increases with the mass of pseudo-scalar state. One can clearly say that sigma model for low-lying M89 replaces Higgs mechanism as an approximate QFT description in TGD framework and a duality like relation between sigma model description of the meson decay amplitudes and those of standard model Higgs is highly suggestive. One can criticize various aspects of the TGD vision about both ordinary and M89 hadron physics. This is good for the simple reason that counter arguments are the best manner to make progress if one is on the right track. TGD SUSY is also in central role if one believes that higher pion like states are there and have an explanation in terms of SUSY. 25 GeV pion like state would be apart from mixing effects spion consisting of squark pair. The assumption is that SUSY is essentially unbroken and that mixing of the quarks implies that mass squared matrix is non-diagonal having element between meson and smeson states. The first possibility is that second eigenstate is tachyonic due to very strong mixing proportional to αs and must be excluded from the spectrum. Second - aesthetically more attractive- option is that second eigenstate indeed is there and quite recently I indeed found evidence for narrow resonances with quantum numbers of pion with mass differences between states typically in the range 10-40 MeV. Some of these might be SUSY states. The experimental evidence suggests that pion has satellites but that their number is much larger than SUSY alone predicts. but that their number is much larger than SUSY alone predicts. The bumpy structure of Higgs-like signal cross section suggests the same for M89 hadron physics. There are two alternative but not mutually exclusive explanations. The color magnetic flux tubes for light quarks have length of the order of Compton length and one could assign to them a string tension and IR Regge trajectories. Another explanation would be in terms of Shnoll effect implying that probability distributions with single peak decompose to distribution with several peaks. The TGD based explanation of Shnoll effect suggests that it is universal and could take place even at the level of particle physics. A strong objection against TGD SUSY is that there is no missing energy signal which should result from the decays of squarks to quark and spartner of W boson decaying in turn to lepton and sneutrino. This objection forces to consider a possible modification of the recent belief system. The covariantly constant right handed neutrino could act as super gauge symmetry annilating physical states. This reduction of SUSY is standard mechanism of SUSY breaking. The color octet CP2 partial wave of right handed neutrino would generate superpartners. Color confinement would eliminate the decays producing right handed sneutrinos as missing energy. What would be nice is that leptohadrons could be interpreted in terms of color octet sleptons (dark in TGD sense)TGD SUSY would be realized in a similar manner both for leptons and quarks and would have been discovered for decades ago. This is of course a speculation and p-adic mass calculations should be carried out to check whether this proposal really works. I do not bother to type more and encourage the reader to find the details in the article Higgs or M89 hadron physics? or the chapter New Particle Physics Predicted by TGD: Part I of "p-Adic Length Scale Hypothesis and Dark Matter Hierarchy". LHC releases data about new particle but is it Higgs? The newest results about Higgs search using 4.9/fb of data were published yesterday and there are many articles in arXiv. The overall view is that there is evidence for something around 125 GeV. Whether this something is Higgs or some other particle decaying to Higgs remains to my opinion an open question. Lubos of course is strong in this faith on Higgs. Somewhat surprisingly Tommaso Dorigo seems the result as a firm evidence for Higgs. Matt Strassler is skeptic. The evidence comes basically from Higgs to γγ decays. There are some ZZ and WW events. CMS represented also data for more rare events. There are also indications about something at higher masses and the interpretation of them depends on the belief system of the blogger. Bloggers were very active and Phil Gibbs certainly the most active one. Phil Gibbs gave online comments and combinations of various data in his blog. In particular, Phil produced a combination of data from ATLAS, CMS, LEP, and Tevatron clearly supporting the existence of bump around 124 GeV. Also the other plots by Phil are very illustrative of the situation: for instance this. Tommaso Dorigo commented the results. Tommaso gives many illustrations and sees the results as firm evidence for standard model Higgs and is skeptic about SUSY Higgs. Lubos Motl has a nice -albeit over-optimistic from SUSY point of view - summary about the results and useful links to the articles by ATLAS and CMS. I liked very much about Matt Strassler's critical comments making clear what is known and what is not known. Also Resonaances had added comments on Higgs. And many other bloggers. It is good to try to summarize what has been found. According to ATLAS the bump is at 126 GeV. Altogether gamma-gamma and ZZ events give 3.6 sigma deviation reducing to 2.3-2.5 sigma by look-elsewhere effect. According to CMS the bump resides at 124 GeV. CMS has 2.6 sigma deviation reducing to 1.9 sigma when look- elsewhere effect is taken into account. The positions of bumps reported by ATLAS and CMS are not quite same so that there is still room for the possibility that the bumps are artifacts. Both collaborations publish also the results about signal for Higgs to ZZ decays. 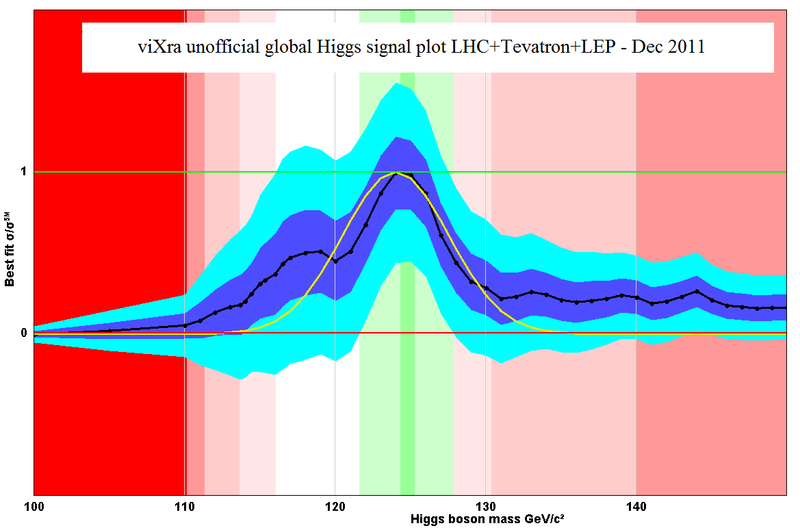 Fig 7 in ATLAS eprint reports three candidates Higss to ZZ events at 123.6 GeV, 124.3 GeV , and 124.8 GeV. 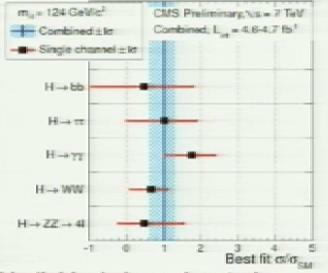 CMS reports results about decays to bbbar, ττbar, WW, ZZ, γγ, combines the data from various channels, and compares signal cross sections to those predicted by standard model Higgs. There is structure around 145 GeV in some channels. There is also data about higher energies bump like structures both below and above 300 GeV. Maybe the standard model Higgs is not enough. SUSY indeed predicts several Higgs like states and M89 hadron physics entire meson spectroscopy. Both ATLAS and CMS have published an reprint in arXiv about Higgs to γγ signal. The ratio of the γγ signal cross section to the cross section predicted by standard model is given together with 1 and 2 sigma bands describing the background signal without Higgs contributions. Fig 8 ATLAS paper gives the observed and expected 95 per cent confidence level limits as a function of hypothesized Higgs boson mass. Fig 3 of CMS paper gives bump around 124 GeV. I wish that I could understand the strange oscillating behavior for the ratio of signal cross section to cross section for signals mimicking Higgs predicted in absence of Higgs. There are bumps around 126 GeV, 139 GeV and 146 GeV. Is this an artifact produced - say - by a discretization in the data processing. There is also a small bump around 113 GeV. I am a statistical dilettante so that I can make an innocent and possibly stupid question: Could these bumps be something real? For standard model Higgs this is certainly not the case but what about TGD inspired view about new physics at LHC. Going to another extreme: could all bumps with 126 GeV bump included be only data processing artifacts? We do not know yet. Also the probability p0 that standard model without Higgs could explain the signal cross section is plotted. Fig 7 of ATLAS paper gives observed and expected p0 values as a function of the mass of hypothesized Higgs. Small p0 tells that standard model without Higgs contribution requires upwards fluctuation whose probability is p0 to explain the observed signal. There are strong downwards bumps at about 126 GeV and around 145 GeV. They are deeper than the prediction of standard model Higgs which might give rise to worries. There is also something very small at 139 GeV. Fig 4 of CMS paper gives similar plot. Now the bumps of p0 are around 123.5 GeV, 137 GeV, and 147.5 GeV. If taken at face value, also these figures suggest three-bump structure. This might well be a statistical artifact but one can make questions and one fool like me can make more or them than the wise guys are able to answer. Here are two of them. Could M89 pion have higher excitations with a mass scale of 10-20 GeV? Could the pion-like state generating the signal besides ground state also excitations with excitation energy scale of order 20 GeV? Could these excitation assigned with the magnetic flux tube structures associated associated with scaled up u and d quarks. A rough guess for the p-adic prime of scaled up u and d quark in M89 hadron is k=113-18= 95 (k=113 corresponds to Gaussian Mersenne and nuclear p-adic length scale). This corresponds to the p-adic mass scale the estimate 16 GeV from electron's p-adic mass scale about .25 MeV. It however turns out that the actual mass must be by a factor two higher so that one would have 32 GeV mass scale. Could stringy excitations with string tension determined by 32 GeV scale be in question? If so then also ordinary pion should have similar fine structure in mass spectrum with energy scale of 31 MeV assignable with u and d quarks with k=113. I have a vague memory that Tommaso Dorigo had reported something about low energy excitations of pion but I failed to find anything about this in web and concluded that I must have been hallucinating. Shnoll effect is something which main stream colleagues certainly refuse to take seriously. In TGD framework one can develop a p-adic model for Shnoll effect which can be justified in terms of quantum arithmetics giving a first principle justification for the canonical identification playing a key role in p-adic mass calculations. The model predicts a number theoretic deformation of probability distributions characterized p-adic prime p. The modification replaces the rational valued parameters of distribution by quantum rationals. Typically a probabiity distribution with single bump decomposes to several ones and the phenomenon occurs also in nuclear physics. Could this deformation be at work even in particle physics? If so, it could cause the splitting of single very wide resonance bump around 125 GeV to several sharper bumps. Even the bump like structure at 113 GeV could correspond to this wide resonance bump. The original resonance bump could be rather wide: something like 30-40 GeV. Very naive guess would be that the width of leptopion obeys able to decay to ordinary quarks Γ ∼ αs(89) m(π89). Already for αs=.1 one could have a bump with width of about 15 GeV. For ordinary pion the impossibility of strong decays would not allow Shnoll effect. The splitting into sub-bumps by Shnoll effect would make this wide bump visible. After a painful web search I managed to find an article titled Search for low-mass exotic mesonic structures: II. Attempts to understand the experimental results reporting that there is experimental support for narrow excited states of pion at masses 62, 80, 100, 140, 181, 198, 215, 227.7, and 235 MeV (authors mention that the last might be uncertain). The states at 100, 140, and 198 MeV are half octaves of the lightest state. The article fits the states to Regge trajectories but it is not possible to use single slope for all states. The mass differences vary between 10 and 40 GeV so that the scale is what one would expect from the above string argument. Also Shnoll effect might explain the existence of the bumps and if the explanations are consistent the spectrum of the pion states is dictated by number theoretical arguments to a high degree. CMS has also a preprint about the combination of signals from all decay channels of Higgs. CMS gives also a figure combination of all CMS searches (γγ, bbbar,ττbar, WW, ZZ). Figure 1 of CMS article shows a clear structure around 124 GeV. There is another structure around about 145 GeV. In standard model Higgs scenario the structure at 145 GeV would not be taken seriously since the cross section need to produce the bump would be much below the predicted one but if one accepts super-symmetric M89 hadron physics, the situation changes. There is also structure around 325 GeV and in the range 260-285 GeV. M89 hadron physics would assign these structures to vector mesons ρ and ω89 and corresponding smesons consisting of squark and anti-squark. CMS gives a plot comparing the ratio of best fit for signal cross section to the predicted cross section for Higgs to bbar, ττbar, γγ, ZZ, WW. 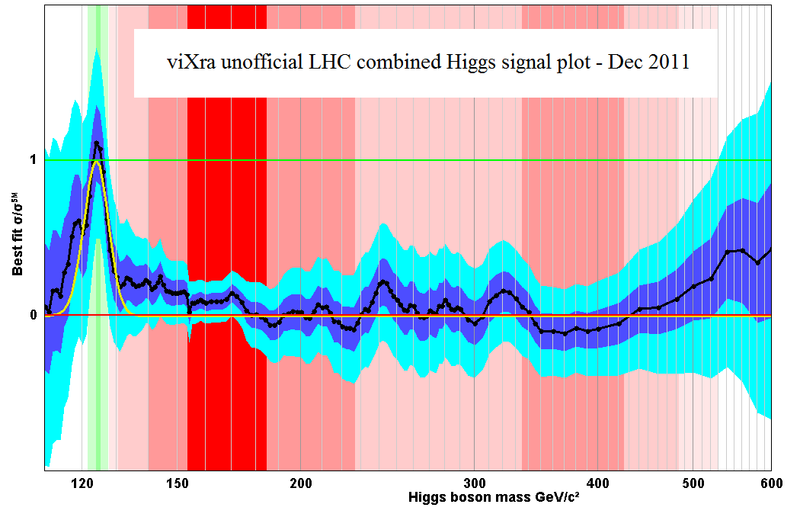 The fit is rather satisfactory: for Higgs to γγ the signal cross section is about 1.7 times higher than predicted. One cannot deny that this can be seen as a strong support for standard model Higgs. The original idea behind M89 hadron physics was that it effectively replaces Higgs. If one takes the CMS result seriously this idea must be realized rather concretely: the predicted signal cross sections must be rather near to those predicted by standard model Higgs. The crucial tests are decay rates to fermion pairs and the possibly existing other resonances. Higgsy character of 126 GeV bump is not proven! Lubos has written a new post were he makes the strange assumption that if there is a signal it must be Higgs. Lubos also uses as a "proof" of Higgsyness the fit of Phil for which the gamma-gamma signal cross section at maximum equals to the prediction. This holds true because the fit forces it to hold true! For some reason Lubos "forgets" this! By inspecting the figure more closely one finds that the observed cross section has a long tail unlike the predicted cross section. This long tail could correspond to the large width of resonance splitting into sub-bumps if Shnoll effect is present. If Higgs option is correct, this tail should disappear as statistics improves. Also the other structures which are present, should disappear. What is of course remarkable that CMS paper shows that H→ γγ cross section is of the same order of magnitude and only about 1.7 times higher than the predicted cross section. This gives a constraint on M89 hadron physics, which it of course might fail to satisfy unless the idea about replacement of Higgs with M89 hadron physics is true at a rather quantitative level. One should also keep in mind that the value of Higgs mass is at the lower bound for the range with stable Higgs vacuum. This is not a good sign. An interesting question is whether the mass for pion-like state of M89 hadron physics is in some sense also minimal and what this minimality could mean physically: some kind of criticality - maybe on instance of quantum criticality of TGD Universe- but not criticality against the decay of Higgs vacuum? To sum up, one can agree with the official statement: the situation remains open. What is nice that there very probably is a signal and from TGD point view the nice thing is that this signal is still consistent with M89 hadron physics.